The growth of live streaming in the video game industry has been exponential. Hundreds of thousands tune in each day to watch along as other people play games. With this rise in streaming has come fresh demand for more accessibility and inclusion, particularly among deaf and hard-of-hearing audiences. One innovation which can help to create accessibility in this area is Communication Access Real-time Translation, or CART. CART, also known as live captioning, stands for Communication Access Real-time Translation. CART uses a combination of software and manpower to deliver live captions in a matter of seconds. Simply put, CART is a service which converts speech into text in real-time. For audiences who are deaf or hard-of-hearing, CART is vital to making content accessible. CART can create accessibility in a diverse range of areas ranging from live television to work and university. With a surge in popularity for live streaming, CART can now also be used alongside video live streams. Gamers are now streaming their gameplay live and direct to audiences around the world using platforms like Twitch and YouTube Gaming. A popular format for streamed gaming video content is known as a 'Let's Play'. This is where viewers watch along as a streamer plays. Streamers often record both their screen and themselves simultaneously to capture reactions and commentary to the game as it happens. As of December 2016, a reported 30% of American gamers say they watch 'Let's Play' live streams and 'Let's Play' gaming videos on a regular basis. These figures aren't small - Twitch leads the pack when it comes to live streaming for games, averaging 953,000 concurrent viewers daily. In 2017, the total audience for gaming video content globally was 666 million. As the leading platform for viewing video game content, Twitch accounts for 54% of global gaming video content revenue. Gamers host streams on their Twitch channels, broadcasting to their loyal followers around the world who are able to tune in and interact in real-time. Some of the most popular streamers have even amassed celebrity status. Ninja, a 27 year-old streamer from America boasts more than 11 million followers. He has been known for streaming his gameplay of the immensely popular Fortnite with celebrities such as Drake and Travis Scott. With such a massive market for gaming video content, it's no surprise that a lack of live captions limits accessibility for some audience members. Providing live captions via CART can help make content accessible to more viewers. But there's hope - we're seeing a push towards content accessibility in streaming. Twitch made a huge leap forward in 2016, when they made a commitment to provide live captions on some of their programs. 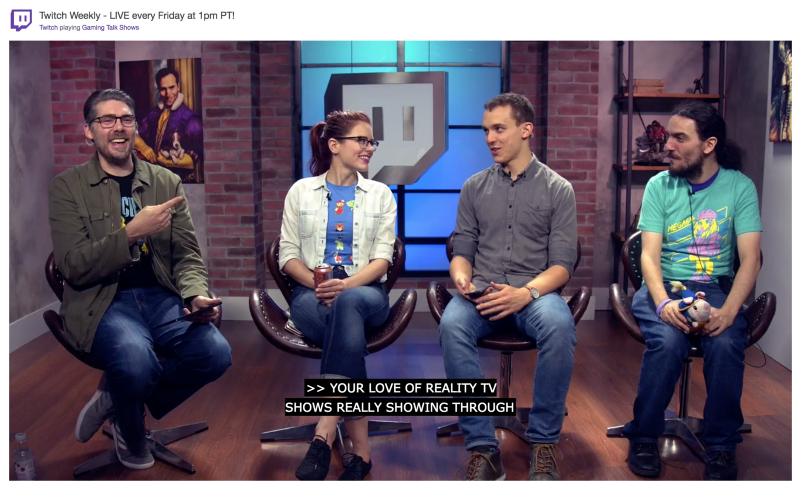 Twitch Weekly, along with their annual TwitchCon which are both streamed live, now come with live captions made possible through CART. Twitch has made their commitment to CART captions loud and clear, stating that "every part of the stream will be captioned right when it happens, so you won't miss out on any unscripted moments". Instrumental to Twitch's shift towards accessibility came from the work of The AbleGamers. The AbleGamers is a non-profit charity which is dedicated to creating greater accessibility in the video game industry. The AbleGamers ran live tests of the new caption system prior to the official launch. With Twitch making a commitment to providing CART where they can, it won't be long before CART is a standardised feature of live-streamed content. If you're a streamer, content producer, or anyone else looking to add captions to their content, you're in safe hands. As a longstanding provider of live CART captions, we're able to help you make your content accessible. Using our Ai-Live platform, we provide live captions for many clients with a diverse mix of unique needs. If you have live content which you'd like to make accessible, get in touch. What is Remote & On-site Captioning? What's the difference between the two? Let's find out! Technologies like captioning are innovating the video game industry, and encouraging a new push for accessibility.